The name of the community is derived from the word sona meaning gold, and the people who work with gold are called Sunar or Sonar. Traditionally they are goldsmiths, but with the availability of better educational facilities the Sonar have become inclined towards education. They claim their social status next to that of the Brahmin. Divorce and remarriage are allowed. A Sonar follower of Christ may lose his place in society, and be ostracized. This is especially an issue for high caste individuals. 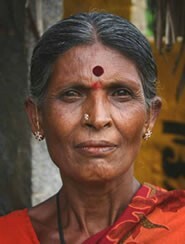 Pray the few believers among the Sonar will grow in sharing and discussing God's Word with their families and clans. There are few if any Christian believers among the Sonar, but pray for the ones that will soon be a part of this community. Pray they be well instructed in the faith, and will grow in maturity and in numbers. Pray they live holy lives. Pray for the Sonar community to be humble enough to acknowledge their need for forgiveness of sin, and that they understand the provision for forgiveness that God has provided. 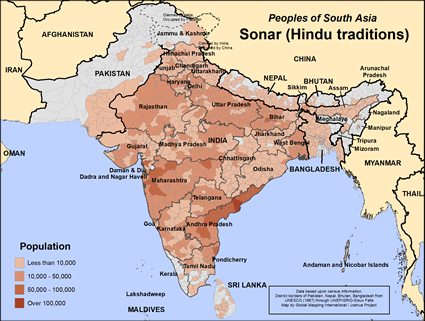 View Sonar (Hindu traditions) in all countries.